Here's my annual Tour de France resource list, posted annually since 2003. If you have a resource to suggest, please send an email with "TDF" in the subject line. NBC Sports Tour de France 2011 All Access - Live video, maps, stats. $30. NOTE: the iPad, iPhone and Android apps are a separate $15 purchase. If you have resources to share: websites, blogs. etc., please let me know, so I can keep this list updated. Send me an email with "TDF" in the subject line. Since 2003, I've maintained an updated collection of Tour de France information, here is that list for 2010. I'm currently checking through the links below, so if you find a bad link or have one to suggest, please send me an email with "TDF" in the subject line. Yahoo! Eurosport Audio (UK) Audio coverage from Eurosport. Since 2003, I've maintained an updated collection of Tour de France information, here is that list for 2009. I'm currently checking through the links below, so if you find a bad link or have one to suggest, send me an email with "TDF" in the subject line. Versus Live Tracker (US) Video, maps, stats. Through the early 1980s, steel alloy was the material of choice for bicycle frames, until manufacturers replaced steel with lightweight aluminum, titanium and carbon-fiber composites. 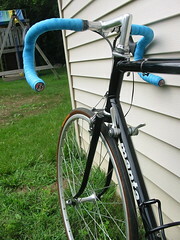 In the early 90s, I found a used, steel frame Manta road bike at a local bike shop. The shop owner explained how durable, smooth and flexible the bike's steel tubing was. I bought the Manta because of the steel frame, and the $125 price tag, then spent a few more dollars restoring and retrofitting the bike. It's been a wonderful bike! Yesterday, I read Eli Milchman's Cycling Purists Rejoice: Steel Is Back at Wired, about the resurgence of steel framed bikes. It's fascinating to see steel making a comeback as a new, cool material of choice. It has been said many times that engineering matters more than materials. But it's not as simple as that. Yes, you can make a strong bridge out of styrofoam, or bike frame out of almost anything, but certain materials have inherent qualities that plain make them more desirable. Steel has been around a long time, and that makes it a hard sell these days. But as a strong, safe, repairable, beautiful, practical, and rugged frame material, it is still the best. The fact that it's not trendy only adds to its appeal. A few years ago I came across Rivendell Bicycles, through my buddy Michael Ashby. These guys are into cycling for pure joy and practicality. The Rivendell crew rejects pseudo race-ready day-glo lycra, featherweight titanium bottle holders and the manufactured bike racing peer-pressure, for seersucker shirts and cargo shorts, steel frame bikes, leather seats and riding bikes because it's fun to do and good for you. I've really resonated with the Rivendell ethos the past few years. Now I leave my lycra stuff in the drawer and ride my bike for fun and to get places, wearing regular 'ol clothes. I've replaced my Shimano clipless pedals on the Manta with old-style toe clips and straps. I still enjoy Tour de France bike racing, but I also realize I'm not a racer and don't need to pretend I'm one when I ride.